This project aims to study the perception of General Insurance of the customer. The project will analyse the impact of Insurance in the eye of the customers on the customer satisfaction levels. It includes the detailed study of customers focusing on the various parameters that lead to identifying and understand the perception of the customer in buying the General Insurance. The scope is limited to the Insurance owners of Bareilly city only. You can also Subscribe to FINAL YEAR PROJECT'S by Email for more such projects and seminar. Insurance other than ‘Life Insurance’ can be categorized under General Insurance. General Insurance consist of insurance of property against fire, theft etc, personal insurance such as Accident and Health Insurance, and liability insurance which covers legal liabilities. There are also other covers such as Errors and Omissions insurance for professionals, credit insurance etc. General insurance or non-life insurance policies, together with automobile and householders policies, give payments betting on the loss from a selected monetary event. General insurance generally contains any insurance that's not determined to be life assurance. it's referred to as property and casualty insurance in the U.S.and Canada and Non-Life Insurance in Continental Europe. 1) To study the types of General Insurance services offered by different companies. 2) A study and analysis of customer’s perception & acceptability towards General Insurance services. 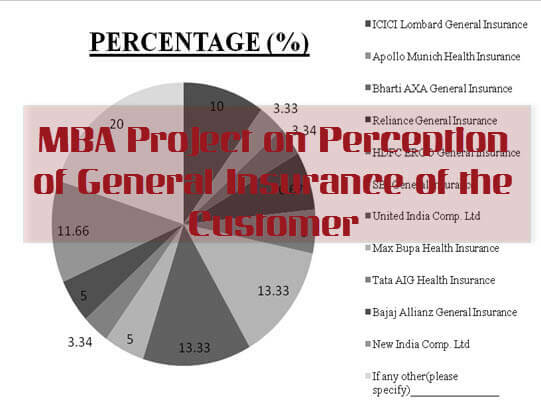 3) Analysis of dependency of customer’s perception towards General Insurance services on demographic parameters. This project contains full study of the subjected project topic "perception of general insurance of the customer" and also includes questionnaire at last. Refer this project report only for help purpose. Final-yearproject.com is a educational website or blog, which help students in deciding their final year project and seminar topic. All the resources in this website are Free of charge. This website is built by the students and is for the students. Over 600,000+ Readers Get fresh content from our blog monthly. Hello, Welcome to Final Year Projects. Hope you will enjoy the FREE projects.